The Houston Texans won their season finale today 14-6 over the Cleveland Browns. They end the season 6-10, which is four victories better than last year. I can’t say it was a very good season. It started going down hill once their running back Domanick Davis was injured in the pre-season and that’s pretty early to start going down hill. Their first round draft pick, Mario Williams, was pretty ineffective this season, while the two people they passed on in the draft, Reggie Bush and Vince Young, did well on their new teams. I can only hope that Williams will be good in the long run. I think the Texans need to look to the running back position and the defensive back position next year. I think Carr is a solid quarterback, he just needs a good running game to release the pressure. Here’s to next year. …against Florida teams. They are 0-6 against non-Florida teams, but that’s besides the point. Unfortunately, they didn’t give tickets out to any of the games at work this week. I was hoping to win tickets to the Texans–Jaguars game since it was only about an hour and a half drive away up in Jacksonville. Texans were up early and held strong winning 13-10, despite missing two field goals. This was their first road win since December 2004. You may be saying to yourself that I haven’t commented on another game which happened yesterday. Well, here at Frenchville, we only talk about positive sports events. We don’t talk about how the Longhorns choked away their chance at a rematch against Ohio State in the National Championship. We don’t talk about how Colt McCoy’s collar bone isn’t broken and he’s questionable in the game against A&M. And, we definitely don’t talk about they now must beat the Aggies in order to have a rematch against Nebraska in the Big XII Championship. I’m stunned. The Houston Texans actually pulled out a win and this season they are 2-0 against Florida teams. Unfortunately they are 0-4 against non-Florida teams. Today they beat the Jacksonville Jaguars 27-7 in the best offensive showing from Houston to date. Carr has been looking impressive and it looks like they finally have a running back that can pick up some yards in Wali Lundy. Now if Mario Williams can just start energizing the defense. The Texans have a long way to go, but it’s always nice to have a win. It’s been a while since I’ve written, so I thought I would do a “month in review”. For the most part September was pretty much another ordinary month in the French household. After the Knight of the Week event, the Longhorns ended up loosing to Ohio State. The defense just looked terrible. I thought Colt McCoy still looked good under the circumstances, for a red shirt freshman. We have him for four more years and he can only get better. After the loss to Ohio State, the Longhorns went on to beat Rice, Iowa State, and Sam Houston State. If they can continue to win out the Big XII, they can still be in the hunt for a BCS bid and a chance at the National Championship once again. But first they have to beat Oklahoma, which is next week. On the subject of sports, it was a good and bad day for Houston sports. Today the Astros lost the last game of their regular season which puts them out of the playoffs this year. It was an amazing last year getting to the World Series and all, but it wasn’t meant to be this year. On the good side, the Texans finally won. They beat the Miami Dolphins 17-15, in a very exciting game. They are now 1-3, which isn’t a great start to the year. Their number one pick in the draft, Mario Williams, got his first sack in the game. So far, the Texans have looked terrible. I’m hoping that they can turn it around, but I’m not holding my breath. On the 8th, I went in for a “touch up” on my Lasik. My left eye wasn’t 20-20, so they offered another session. It was really easy, much easier than the first time. Apparently the “flap” that they cut in your eye doesn’t heal in six months. So, they reopened the flap and re-lasered the eye. Immediately after the surgery I was seeing much better. It’s amazing. 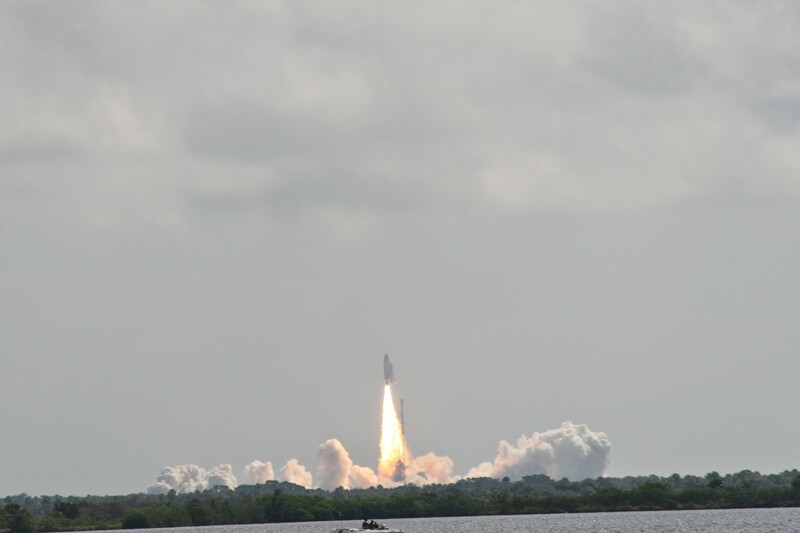 On the 9th, we went and witnessed our first shuttle take off. We discovered that the place the shuttle takes off from is only about twenty minutes from our house. We just parked on the side of the road and walked up to the bridge that goes out to the Kennedy Space Center. Someone had their radio tuned into the countdown and when it reached zero, there was a brilliant light and the shuttle was lifted into the sky. It was amazing and can only suggest that if you haven’t seen it you should come to Florida to try and see the shuttle take off. Currently the next shuttle is schedule to go off at night. We are thinking of making a trek out for that one as well. In other news Jennifer was named Abby’s “room mom”. So, she helps out and coordinates parties for the class. This week she went up for Apple Math and Science Day. They had four different stations and Jennifer manned the “less than or greater than an apple” station. She would name an object and then the kids would have to say whether it weighed greater than or less than an apple. Abby’s doing really good in school. She got her first report card this past week. She got all “Satisfactory” grades. They don’t start getting letter grades until second grade.